Hi! I’m Dexter and I welcome you to my website. I’m not much for this new technology, but nowadays if we want to stay connected, nothing is faster nor more convenient than the internet. If you’re a serious fiddle player, I’m happy and thankful you found me. I truly love playing and crafting fiddles, and I become very attached to each and every one of them. But since I can’t play them all, it’s always a pleasure to sell some to folks like you who can put them to really good use. To give you a little history, my father was a carpenter and fiddler in Nova Scotia before settling in RI. At the age of ten, he started to teach me how to work with wood. Since I wasn’t much for sports, I took to this skill as a way to stay busy and have fun — and to this day I still enjoy it! Besides handcrafting fiddles, fiddle stands and wooden musical spoons, I also play harmonica, spoons and feet in two contra dance bands. My own band,The French Connection: Traditional Contra Dance Music with a French Accent^, and a buddy's, First Time String Band. Then there's KC Moaners: A Jug Band. With them I play harmonica, spoons, my own handmade gut bucket bass, and sing vocals. Check us out in the SCHEDULE section, and come hear us if you're in New England! Making music and making fiddles just seems to tie everything together for me. 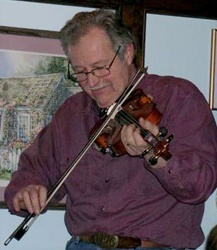 If you’re serious about improving the quality of your fiddle playing, then I suggest you give the DEXTER FIDDLE a try. I completely understand that any purchase of a quality instrument needs a test run. All my violins have a 30-day money back guarantee. Get a DEXTER FIDDLE — and have fun with it!